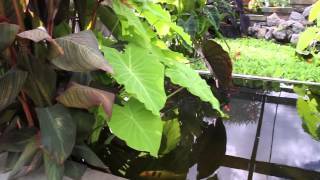 Canna Lilies are very versatile, perhaps even more than Alocasia (Elephant Ear). Not only can they go in soil or water but they can take full sun and they can be in a half-day sun to a half-day shade. 'Tropicanna Gold' and 'Pretoria' are two varieties on the market which basically look identical. Both have beautiful yellow and green lining on their foliage and are really nice to have in the yard. Canna lilies are typically known as a great centerpiece for planters in full sun. They are mainly sold on the market but they can also be used in your water features or in water, little water gardens, and so on. 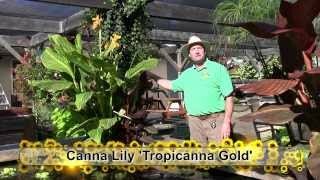 Canna Lily 'Durban' and 'Tropicanna' are also similar varieties. In some years we carry "Durban", in some years we'll have "Tropicanna". They both have beautiful orange stripes. The "Pretoria" has the yellow stripes. "Durban" is more of an orangey-red kind of stripe to the leaf. Both are absolutely gorgeous! Like "Pretoria" and "Tropicana Gold", it has an orange flower to it. Canna Lily 'Australia' is becoming one of our most popular sellers. It has a very consistent, dark colour, and a nice shine to the leaf. It is fast growing and multiplies well so you get multiple stalks usually in one season from this variety. It has a nice, glossy, burgundy foliage to it. Height-wise, you're going to get four feet out of it in any kind of planter situation. It’s a really nice centerpiece for planters and has red flowers.